A group of assembly members has questioned why a school improvement scheme was scrapped before it was fully assessed. The £20m-a-year Schools Challenge Cymru (SCC) will not be funded beyond this summer. Its founder, Prof Mel Ainscow, has described its impact as "remarkable". 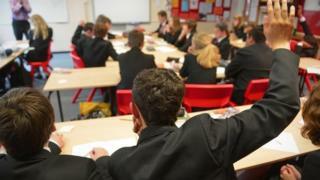 The Welsh Government said it welcomes progress made by the schools but the programme was "time-limited." SCC was established by the then education minister Huw Lewis in 2014 and followed similar schemes in London and Manchester. He described it as a "game changer" for 40 underperforming schools which would have access to extra funding and expertise. But his successor, Lib Dem Kirsty Williams, decided in October that the scheme would not be extended beyond its initial three years. BBC Wales has been told by a source close to the original plans that it was intended to run for at least six years, more in line with the London programme it was modelled on. In response the Welsh Government described that as "factually incorrect." A final independent evaluation of SCC has not yet been published. Labour AM Lynne Neagle, who chairs the assembly's education committee, told BBC Wales: "The committee has raised the discontinuation of the Schools Challenge Cymru programme in both general scrutiny and budget scrutiny sessions with the cabinet secretary, as well as in correspondence. "In particular we have raised concerns about the decision to discontinue the programme before the programme was fully evaluated." The committee will begin an inquiry into the government's use of targeted funding for schools which will include SCC. Newly-published government data shows between 2014 and 2016 SCC schools improved their GCSE results in English, Welsh and maths at a faster rate than non-SCC schools. SCC schools increased the proportion of students getting A* to C in GCSE English by 5.5%, compared to 3.5% for non-SCC schools. In Welsh there was an 11.9% improvement in SCC school compared to 1.5% for non-SCC schools. And in maths SCC schools improved by 7.9% compared to 5.6% for non-SCC schools. But in science, the performance in SCC schools declined by 1.7% while improving slightly in non-SCC schools. Prof Ainscow said: "In some cases, the gains in terms of examination results have been remarkable. "The improvements in London had an investment over eight years and things have continued since then. "I hope the Welsh Government will find ways of taking the lessons from SCC - including things that didn't work - and use those to guide policy in the future." But Gareth Evans from University of Wales Trinity Saint David said performance had been mixed. "Schools Challenge Cymru has not had the same impact across Wales and while some schools have moved forward tremendously, others have stalled," he said. "At the end of the day, £20m is a significant amount of money and in times of economic austerity it is important we make the very best use of what finances we have." A Welsh Government spokesman said: "We are committed to improving standards and raising the aspirations of children in all schools in Wales. "We therefore welcome the progress schools have made. "SCC was designed as a time limited intervention to accelerate progress in challenged schools and generate lessons to support improvements in the wider system. "We are committed to embedding the learning from the challenge for the benefit of all schools in Wales, and look forward to receiving the final evaluation report later this year."